The priests and priestesses in the Inca empire were very important and highly respected. They held many jobs such as healing the sick, performing ceremonies, taking part in confidential decisions and a few other tasks like presenting the sacrificial rituals. Healing the sick were one of the main jobs the priests did. 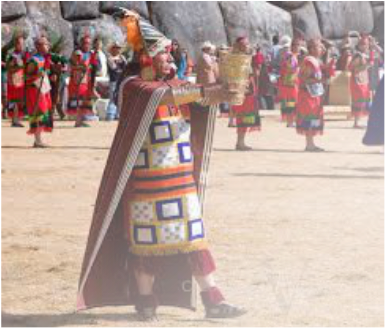 The priests were seen as doctors because it was believed that they had the power to heal because they were able to be in direct contact with the Inca gods and know what to do. Other than healing, the priests attended deaths and helped pregnant mothers to deliver. The priests and priestesses also took care of the temples, and just like the modern ones today, they taught the message of god to others. When death came for the few who weren’t able to survive through their illness, the bodies were stripped of their internal organs and were dried out. Just like a mummy, the bodies were wrapped in layers of cloth and were positioned with their chins on their knees. At the end of the small process, if the mummy was a noble or an emperor, a golden mask was placed upon their face. All of these ceremonies were mainly done by the priests and priestesses. During the funeral the relatives would put on black clothes and the women cut their hair. There would be a funeral feast, sad music with slow dancing involved and funeral rites that could go on for eight days for a noble. The mourning dress could be worn for a year depending on the position in the government that the loved one had as many respected the nobles and emperor. The mummies were offered food and chicha beer regularly by the priests. Once a year the mummies of the emperors were brought out during festivals as it was believed that the spirits of the dead wanted to join the celebration with the rest as well.